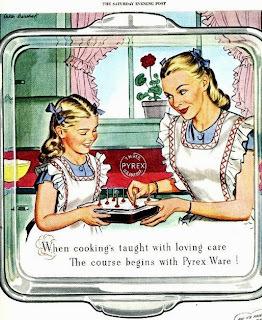 I just love this vintage advertisement for Pyrex. It is too cute for words. So as I do when I have time to kill... I roam around in eBay looking for the oddities. Today I spied a couple of neat things in the Pyrex division. Neat vintage items. First up. A set of clear mixing bowls. A set I have not ever seen in person. And they are mint in package too. I have a set of these older mixing bowls, the standard round set. That I use all the time. But this set of vintage bowls... actually have a flat hand tab and a pointed pour spout. And they were bought on sale! For a buck twenty seven! Then got left in the cabinet never to have been used. Now I have seen quite a few sets of the Pyrex primary colored mixing bowls... with their label intact. But this set actually has its original Pyrex box too! I have seen oodles of the coffee carafe's from Pyrex. All kind of shapes and handles. Lots of great mid century designs on them. But this is the first time I have seen the coffee carafe' with its matching creamer and sugar bowl. Oh I like those first bowls. It would be nice to have both of those sets. I don't need anymore primary bowls, though. I have, I think, 7 sets. One looks unused. I will have to watch those and see what they go for. PS, my mom always used her big yellow bowl to mix her pumpkin pie filling in, so I do the same thing with mine! I am really fascinated by those clear Pyrex bowls, with that tab handle. I have seen a lot of clear vintage Pyrex bake ware... but never seen any of those before.